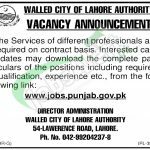 Get Walled City of Lahore Authority Jobs 2018 Application Form Online | jobs.punjab.gov.pk at this page of our site. WCLA abbreviation of the Walled City of Lahore Authority which is a semi-government organization in Lahore, established by the Government of Punjab for conservation, planning, and development, regulation and management in Lahore. Walled City Lahore Jobs are Government sector jobs announced for the residents of Lahore and latest Walled City of Lahore Authority Jobs 2018 are announced for the educated, experienced, hardworking and well-disciplined candidates such as (Assistant Director (Building Control & Commercialization), Assistant Director (Electrical Engineering), Assistant Director (Engineering), Auto CAD Operator (Disabled Quota), Computer Operator (Disabled Quota), Cultural Heritage Specialist, Deputy Director (Design), Deputy Director (IT), Deputy Director (Land Records & Property Transfer), Deputy Director (Water Supply), Field Activist, Graphic Designer, Senior Scale Stenographer). Appointment of these positions will be held on contract basis and duration of the contract is extendable on satisfactory performance of an individual. Candidates willing to apply should hold the qualification from Masters/Bachelors/Intermediate and experience as per the demand for vacant positions is compulsory. So, only suitable candidates meeting criteria should apply as per the following how to apply procedure given below. Applicants meeting criteria are suggested to apply online at www.jobs.punjab.gov.pk. To Apply Online, every candidate needs to sign up first at the prescribed site and then create your profile there providing complete detail such as Name/Father's Name/NIC Number/Address/Qualification/Experience. Once you create your profile then search the relevant department, selected the relevant post for which you are interested and apply online. The Last date for submission of application is April 23, 2018. Only online applications will be entertained for the selection procedure. Last Date to Apply: April 23, 2018.